On September 15th, 2011, I had attended Sir Alistair Rai's 'A Global Affair at The Pierre', a shopping event celebrating the Fall 2011 collection with a sneak peek at Spring 2012. Guests enjoyed signature "Twist and Pout" drinks at Two E Bar/Lounge at The Pierre Hotel. This was the first time I was able to view the Sir Alistair Rai gorgeous print scarves, with prices ranging from $50-$140. 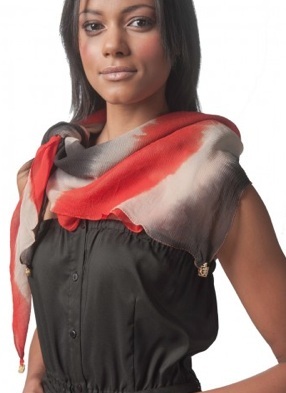 So many scarves to choose from, including floral, ikat and animal prints, from vibrant to softer hues. The scarves are made of silk chiffon, viscose, and mohair/acrylic. Here are a few of my favorite Sir Alistair Rai fall prints, showcasing several different ways you can wear the scarves. It was so hard to choose just one print, but ultimately I went with the Camo Handkerchief Scarf in Gray. I love the fun tassel details and it's easy to pair with a dress, skirt or jeans.